The Health Care Club is one of the special interest groups at Cazenovia College. The club's mission is to focus on community service, participate in one large community service event per year, and build community relationships with healthcare-related businesses. Its goal is to develop career opportunities for students and to involve them in community healthcare-related activities. The Health Care Club's members give back to deserving groups in the community in a fun and relaxed way. Current club President Chris Westbrook, business management junior, describes the Health Care Club as a group that gives back to the community. "The Health Care Club stems from Cazenovia College's part-time Health Care Management program and minor. The 15 active student members all have a passion for community service and come from different programs." In November, the health care club members went to the Young at Heart Senior Citizen Center in Cicero and served Thanksgiving dinner to 95 senior citizens. 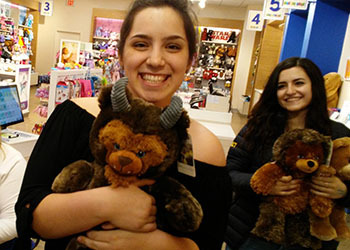 In April, the Health Care Club took its annual trip to Build-a-Bear to make stuffed animals to donate to the siblings of sick children at the Make-A-Wish foundation. Some of the stuffed animals were contributed to the Senior Capstone Gala to be raffled, and others were donated to the Golisano Children's Hospital. The club invites students who are interested in healthcare-related community service to join the club. Students can contact Chris Westbrook (cdwestbrook@cazenovia.edu), or Staff Advisor and Assistant Professor Joni Koegel (jakoegel@cazenovia.edu).